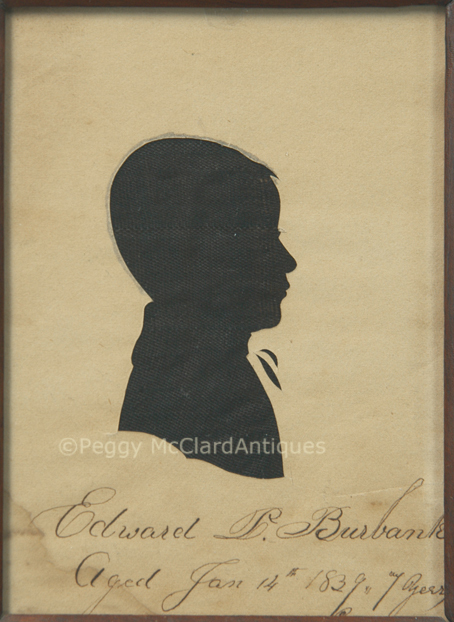 American hollow cut silhouette of a seven-year-old boy identified by a period inscription as “Edward P. Burbank / Aged Jan 14th 1839, 7 Years”. Young Edward has a high collar delicately stock tie and a double curved bust termination line. There is light pencil embellishment around the profile as added hair. Visible stylus lines are always a plus with hollow cut silhouettes and you can see a faint stylus line along the back of the profile. There is a very small tear at the back corner of the bust line and a light moisture stain in the lower left corner of the paper. 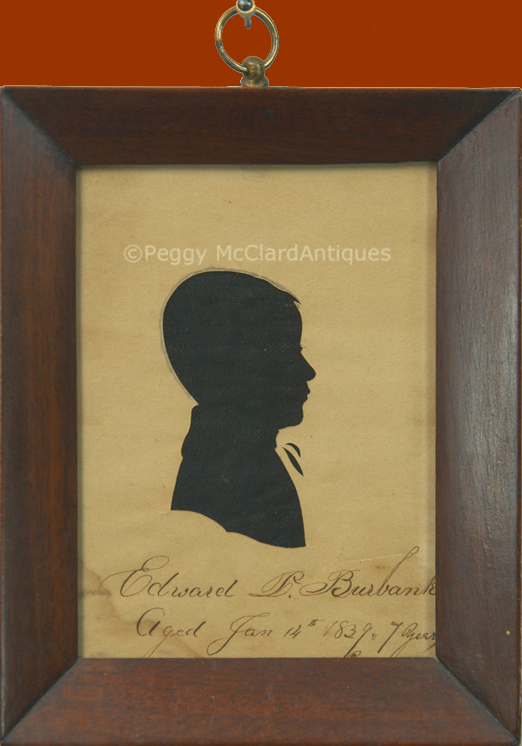 The silhouette is housed in a period wood frame of original size with splined corners and an inward slanted flat profile. Framed size is 5 1/8” x 4 1/16”, not counting the brass hanging loop. I found that Edward Payson Burbank was born January 14, 1832 in Shelburne, Coos County, New Hampshire and died there August 22, 1918. His parents were Barker Burbank, born September 8, 1795, in Bradford Essex, Massachusetts and Polly Ingalls, born 1799, probably in Shelburne Coos. Barker Burbank served in the Revolutionary War. Around 1858, Edward married Mary Smith, also of Shelburne Coos. Together, they had at least 6 children. The 1880 US census shows him as a farmer, living with and 5 children. His mother, Polly was still alive and listed on the same page of the census in 1880. In 1900, the census still listed Edward as a farm but only one son still lived with he and Mary. The 1910 census shows that Edward and Mary were living in the home of son, Abraham and Abraham’s wife and son. Edward has no occupation listed in 1910. Mary predeceased Edward by 2 years and both are buried in Burbank Cemetery, Shelburne, NH.